BizWest publisher and editor Chris Wood moderates a question and answer session with Gibbons-White's Angela Topel and Re/Max of Boulder's Todd Gullette at the 11th annual Boulder Valley Real Estate Conference held Nov. 15 in Boulder. BOULDER — Looking into their crystal balls, experts are not seeing a slowdown in Boulder Valley’s residential and commercial real estate markets in the near future. 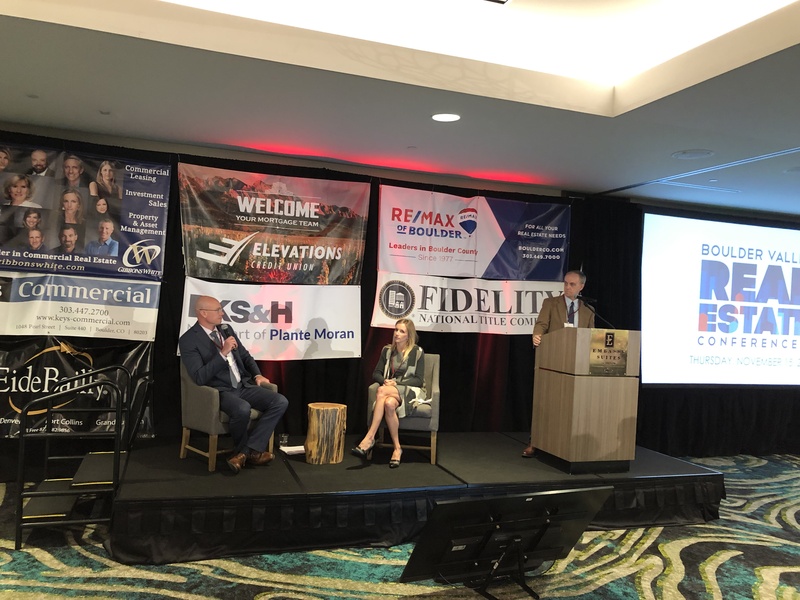 Angela Topel, senior broker associate with Gibbons-White, Inc., and Todd Gullette, managing broker at Re/Max of Boulder, joined forces at the 11th annual Boulder Valley Real Estate Conference held Thursday in Boulder to provide an industry forecast. The takeaway from both was roughly the same: Don’t expect the local markets to lose steam. “I think we are just going to continue to thrive,” Topel said, adding that she expects the commercial real estate market to be driven in large part by innovative companies moving to or expanding their presence in the area. Topel highlighted recently delivered or upcoming commercial projects including the S’park office space in Boulder, which will be anchored by software firm Splunk, and a new 56,000-square-foot creative office space coming to 5505 Central Ave. at Boulder’s Flatirons Park. “Our market is really staying steady and strong,” she said. Vacancies rates or commercial properties have been relatively stable in 2018 across much of the Boulder Valley, according to statistics shared by Topel. In Boulder, office vacancy rates sit at about 6 percent. Industrial and retail vacancy rates are roughly 4.4 and 6.5 percent respectively. Broomfield’s office space vacancy rate is 8.75 percent. Industrial and retail vacancy rates in the city are roughly 5.8 and 8.25 percent respectively. Longmont’s office vacancy rate is slightly higher at 15.25 percent, while the rate for retail space is relatively low at 3 percent. In Lafayette, office vacancy rates are about 10 percent. Industrial and retail vacancy rates are roughly 9 and 2 percent respectively. Vacancy rates in Louisville are slightly higher by comparison. The office rate is 7.5 percent, the retail rate is about 17 percent and the industrial rate is 20 percent. The residential market in Boulder Valley is expected to continue to be characterized by low inventory and rising prices, Gullette said. “One of the overriding truths in our market is low inventory,” he said, adding that the inventory for single-family homes is at historic lows. Because there are fewer homes to sell, brokers must find innovative ways to differentiate themselves, Gullette said. Homebuyers, sellers and brokers — especially in the Boulder market — must adjust to a new normal in terms of pricing. “Year after year, I’ve said it myself, prices can’t keep going up and up,” Gullette said. And yet, prices do continue to rise. Single-family home median prices in Boulder jumped from $642,000 in the first three-quarters of 2013 to $966,000 for the same period in 2018. Over that five-year span, prices in Longmont rose from $262,000 to $432,000. In Broomfield, median prices jumped from $359,000 to $525,000. The number of Boulder County homes and attached dwellings sold for $1 million or more roughly tripled since 2013.